Of all the outstanding Valiant titles, I’ll go out on a very stout limb and say that Archer & Armstrong is easily my favorite. As a fan of the “buddy movie”, growing up through the eighties watching movies like Red Heat and Die Hard, there’s something about the humorous cord that’s struck when two very different people are pushed together to save the world. In the case of A&A, we’re first introduced to the immortal Aram Anni-Padda, of the ancient Mesopotamian Anni-Paddas, in the middle of a family dispute. His brother Ivar wants to use an item of immense power, called the Boon, to revive their recently deceased brother Gilad. With the knowledge that the Boon can only be used at a great price, Aram is against the idea. Ivar uses the device, all life on earth is wiped out, except for the three brothers who are made immortal. Flash forward a bit, to present time, for our introduction to Obadiah Archer, raised among his adopted brothers and sisters, trained from the time he could walk to be a living weapon for righteousness, to battle the forces of Perdition on behalf of the Reverend and Congresswoman Archer. Being particularly gifted, able to master any technique he views firsthand almost immediately, the young Obadiah is tasked with leaving the Archer family compound, traveling to the den of sin that is New York City, and to remove evil incarnate from the eyes of the Lord for all time. His target is Aram Anni-Padda, and the tool he’ll use to track the immortal beast is a piece of the very Boon that created him. Things get interesting when the two meet… Now going by the name Armstrong, Aram is currently occupied as a bouncer in a seedy dive bar. Maybe not the most noble of occupations, but it does give him easy access to wine, women, and song. More accurately booze, floozies, and honky tonk tunes. It’s here that Archer & Armstrong have their inaugural meeting in, of course, an all-out bar brawl. If you haven’t already read any of the Archer & Armstrong books, I would have to say that you’re missing out on some quirky, hilarious, damn near flawless story-telling. The comic series, originally concocted by Barry Windsor-Smith in 1992, the title was given new life by Valiant in 2012, along with most of the Valiant titles. If you’re thinking that there’s just too much backstory to have to read through, that you don’t really have the time to play catch up at this point, you may be interested to know that Pendant Audio is producing an audio production of the Valiant buddy-action-comedy. Before you scoff at the notion of an audiobook version of a comic, read on for just a little longer. This isn’t just a reading of the comic, no mere audiobook. Pendant Audio has put together a fully scripted audio production, complete with voice acting, sound effects, and a musical score. Every element of the story is present, from Archer’s right wing homeschooled naiveté to Armstrong’s blustering use of poetry to hide the fact that he’s blind drunk. Granted, some liberties were taken with the original book’s content, but it was all done with loving care, in the interest of adapting the very visual medium of the comic book into an audio version. Some of the highlights to this production, aside from the very well-cast and excellently voice-acted talent involved, were the very tweaks and adjustments made. For instance, in the comic book there are narrative text boxes that serve to identify the particular martial arts style that Archer is using at any given time, along with a brief description or history of that style (“ca-po-ei-ra is a martial art/dance style invented by the descendants of African slaves in Brazil”). This is kind of a cool little touch that shows Archer’s very structured upbringing, his detailed and comprehensive training and education, and the almost clinical way in which he approaches combat. Obviously, none of that is going to work in an audio production, so the folks at Pendant Audio took it a step farther and made it part of Archer’s dialogue… sort of a quirk he has, giving his own narration and explanation to his exploits. Of course, as he’s talking out lout to himself in the middle of the action, Armstrong calls him out on it and we have a pretty funny little exchange as a result. With each episode covering an issue of the comic (#’s 1 and 2 currently available through Amazon, Audible, and iTunes), what we have is a perfect little piece of entertainment for the drive to work. You get to catch up on some solid work from the kids at Valiant, maybe find yourself another series to add to your monthly “pull”, and enjoy the full hands free experience. 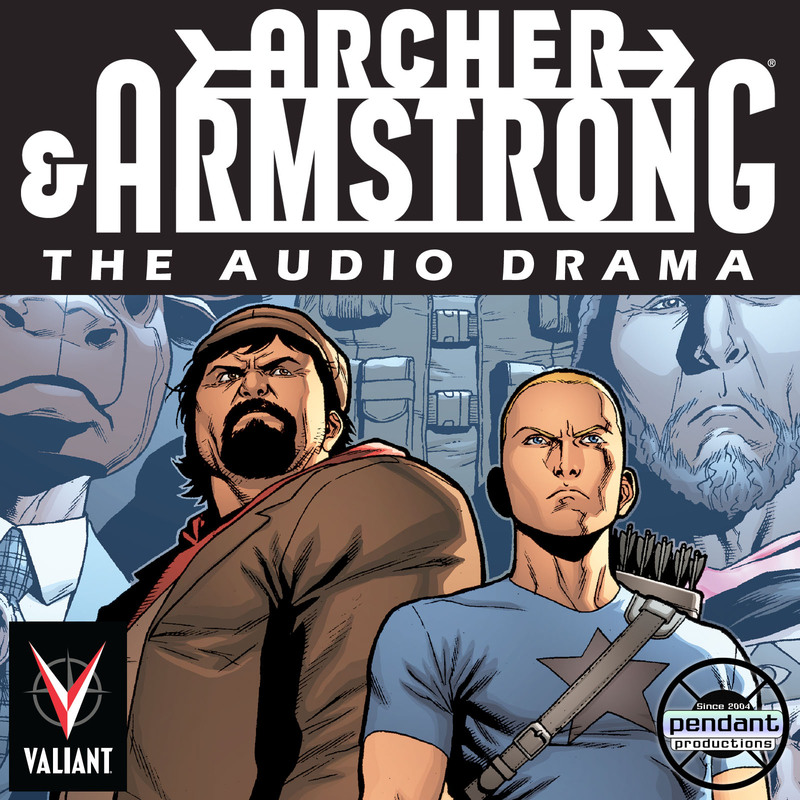 If you’re already a fan of Archer & Armstrong, the dysfunctional duo, I can tell you that this is still an entertaining refresher. The cast and crew have done a great job of putting together something for fans, old and new. How far into the comic series Pendant Audio runs with their production would be entirely up to you, good reader.